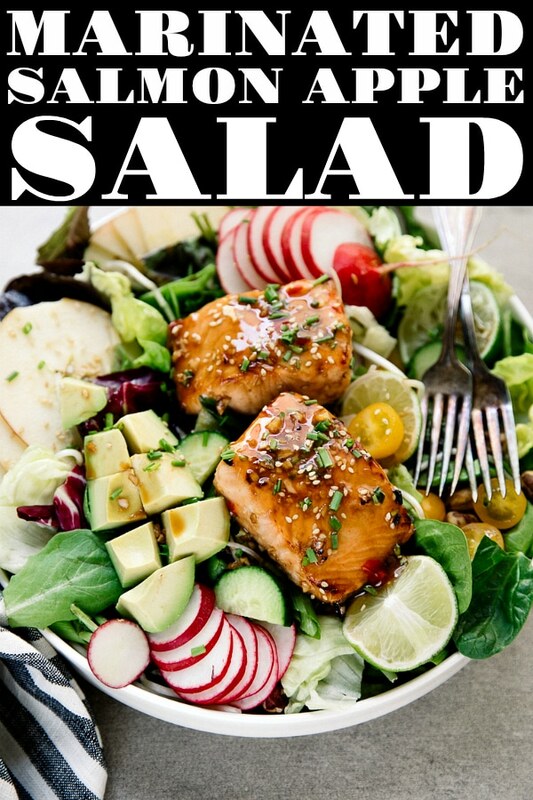 MARINATED SALMON APPLE SALAD WITH HOMEMADE SESAME VINAIGRETTE is a fresh and easy dinner solution perfect year round. Made with wild caught salmon and set on a bed of fresh crunchy greens, creamy avocado, sweet apples, juicy tomatoes, and hazelnuts, there’s a little something for everyone in this easy healthy Salmon Apple Salad. 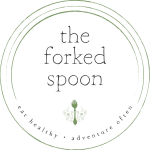 Salmon Salads are a favorite here on The Forked Spoon and include this Citrus Smoked Salmon Salad with Sweet Orange Mustard Vinaigrette, Asparagus and Avocado Potato Salad with Poached Egg and Salmon, and Teriyaki Salmon Salad with Strawberry Vinaigrette. Whenever I feel the need to press the reset button on my diet I’ll usually make and eat salads for a few days. 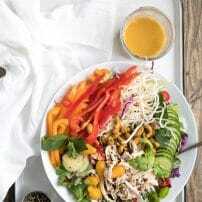 Originally terrified of making salads at home with my own ingredients, I have learned over the years that homemade salads are healthier, tastier, and fresher than anything you will ever get from a restaurant. 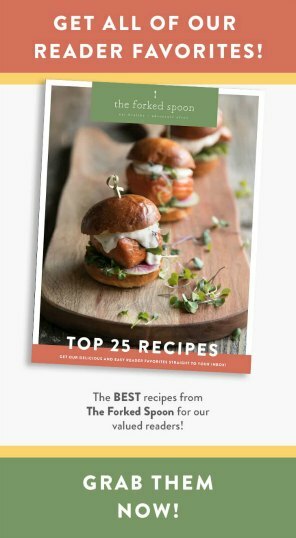 I have also discovered that salmon is one of my favorite salad toppers and this Marinated Salmon Apple Salad is no exception. Make your marinade. The ingredients are simple- lime juice, soy sauce, honey, Sriracha, and garlic. Broil the salmon and transfer the leftover marinade to a small saucepot with the Sweet Chili Sauce. Boil that beautiful, delicious sauce. Build your salad. Top your salad. Drizzle your salad. Obviously, that was the simplified version of how to make this Salmon Apple Salad. 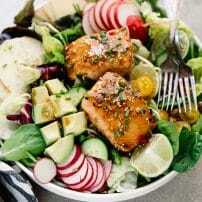 Before you scroll down to the full recipe, however, and see all those ingredients and all those instructions I wanted to explain that despite all that, this Salmon Salad is really quite easy. DO YOU HAVE TO MAKE HOMEMADE SESAME GINGER VINAIGRETTE? No way! You don’t have to do anything. In fact, if there was one part of this recipe that I recommended buying store-bought, it would probably be the vinaigrette. But, and this comes with a big BUT, I urge you to carefully look at the label of the salad dressing or vinaigrette you are purchasing. After all, not all salad dressings are created equal, and some of those store-bought salad dressings? Well, they can be sneaky. If you’re wondering about the ginger, or how to mince it, I peel it and then I use a MICROPLANE (the same kitchen tool that I use to zest citrus). It is one of my most-used kitchen tools. 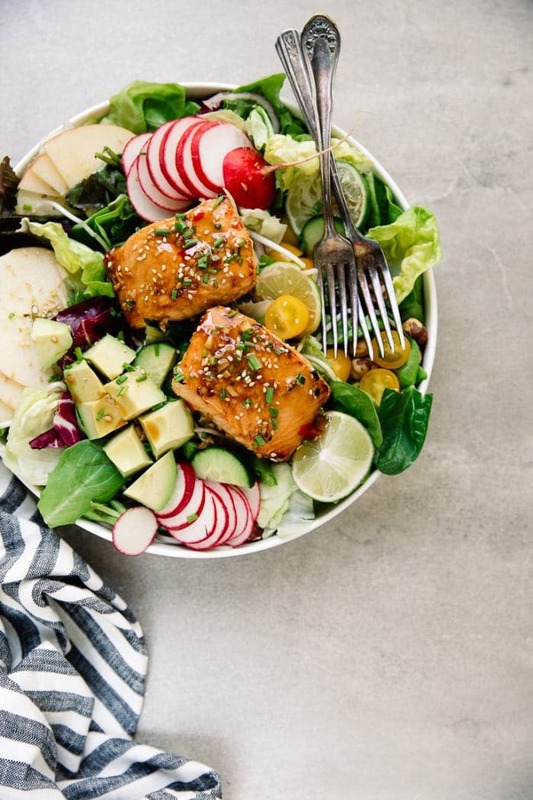 CAN YOU MEAL PREP THIS SALMON APPLE SALAD? Yes! Absolutely! In fact, this Salmon Salad is a terrific example of meal prep perfection and I’m going to tell you exactly how to do it. Prepare, marinate, and cook the salmon as instructed. If you want enough for several lunches or dinners, you may want to double the recipe. Cook the sauce using the remaining marinade according to instructions below. Options- meal prep either salad bowls or salmon and rice bowls. Or both! Decide how many meal prep bowls or trays you want. 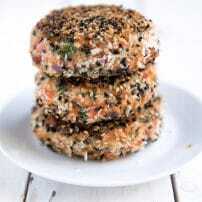 Once salmon has finished cooking, divide among bowls and drizzle with the marinade sauce. Add either rice or salad (or both) to the other side of the bowl, seal with a tight-fitting lid, and store in the refrigerator until ready to eat. If you are adding fresh greens, do not toss with salad dressing as it will make the lettuce soggy. Wild caught salmon is marinated in an easy, simple homemade marinade of garlic, honey, and soy sauce. 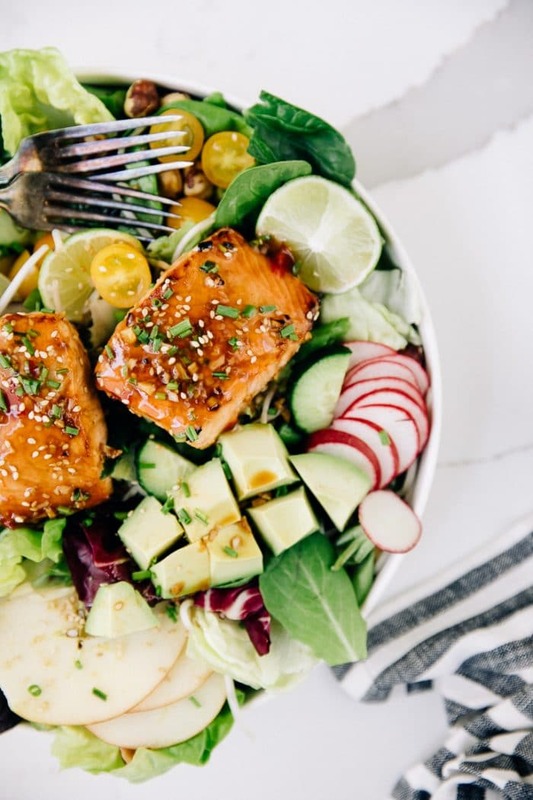 Broiled to perfection, the salmon is coated with a sweet chili sauce and placed on a bed of fresh, crisp greens with creamy avocado, sweet apples, juicy tomato, and macadamia nuts and drizzled with an easy homemade sesame ginger vinaigrette or store-bought dressing of choice. 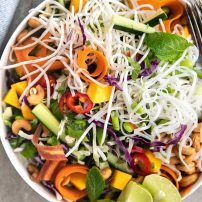 In a medium bowl whisk together all the ingredients for the marinade except for the Thai Sweet Chili Sauce and Sesame Seeds. Transfer the marinade and the salmon fillets to a large ziplock bag. Press all the air out of the bag and seal tightly. Turn bag over several times to fully coat salmon in the marinade. Allow salmon to marinate for 30 minutes. When ready to cook, line a large baking sheet with foil and set the oven to broil. Place each salmon fillet on the baking sheet, skin-side-down. RESERVE THE MARINADE. Place the baking sheet in the oven and broil for approximately 10 minutes, or until internal temperature reaches 145 degrees with a digital thermometer. Meanwhile, add the reserved marinade to a small saucepot over medium-high heat. Add the Thai sweet chili sauce and sesame seeds to the saucepot and bring to a boil. Reduce heat to low and simmer for 5 minutes. Remove from heat and set aside. Add all ingredients for the vinaigrette to a jar with a tight-fitting lid and vigorously shake to combine. Season to taste and store in the refrigerator until ready to use. Add all ingredients for the salad to a large salad bowl, or individual salad bowls, and gently toss to combine. When ready to serve, top with salmon fillets and the prepared Sesame Ginger Vinaigrette and warm marinade mixed with Thai Sweet Chili Sauce, if desired. Salmon and fruit – so healthy! 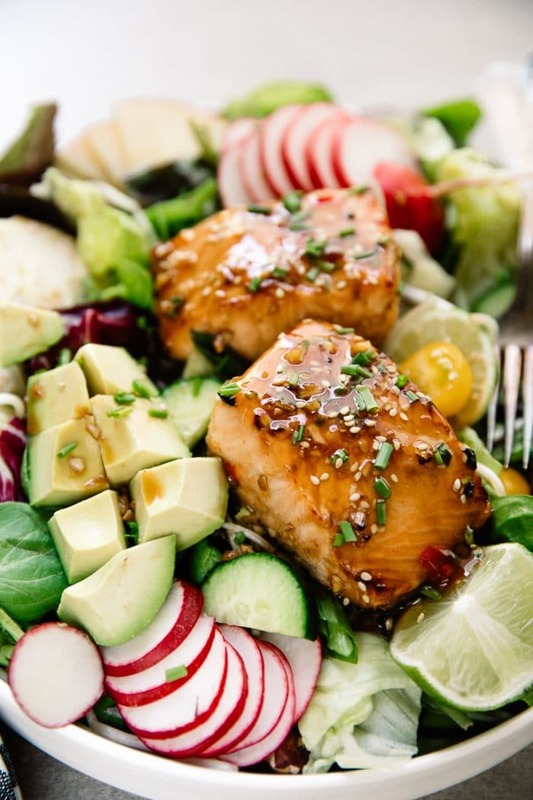 My girls love Salmon and would love to have this salad for dinner, thanks for the recipe! Oh my goodness this salmon is so appetizing!! I totally want to make this! Pinned!! Thank you so much, Camila! Baked salmon is my absolute favorite! I haven’t had a salmon salad in forever! This is perfect and now I’m drooling! Wow! 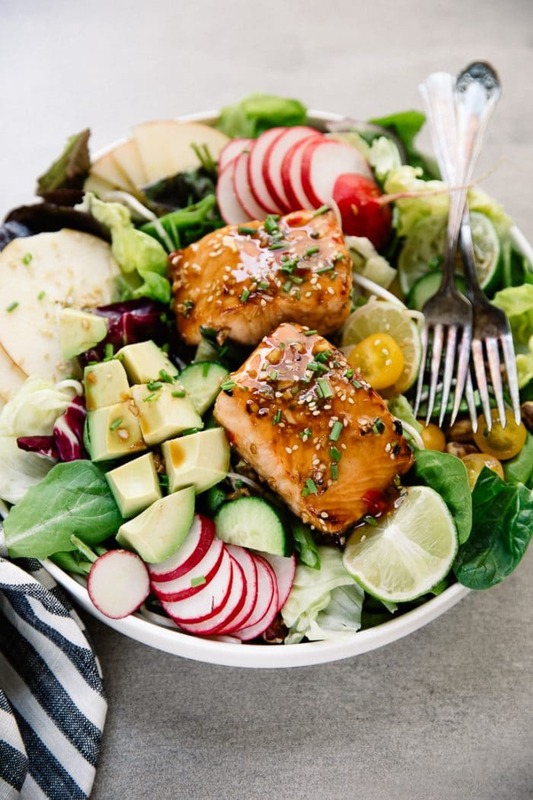 I adore salmon salads and this is one of the most beautiful salmon salads I’ve seen. I want to eat through the screen!